I think it would work if I used code down the line of this in the expression editor for the geometry generator. I'm not sure if I have all the < and > correct but that's beside the point. The issue with that is that I can't seem to figure out how to get the width and the height of the label. I am not very good with the expression editor, and have never done anything with the function editor. 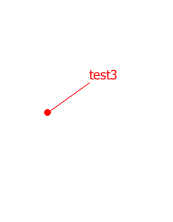 the 'closest_point' statement you'll only need if the geometry is polygon or line. That works really good, with the exception of the situation where the label is directly above the geometry. in that case it moves the label off to one side or the other. I'd like to also be able to place a label like the first picture in my question.. 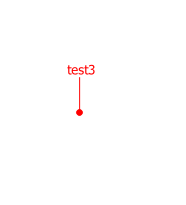 I have added a expression for the horizontal with something like a treshold (variable d in meters) . between +d and -d around the label it will be centered. That's getting better. The issue is that it fails quit badly when there are a large range in label lengths, or when changing zoom levels. Is there any way to get the length of the label in meters on the map? 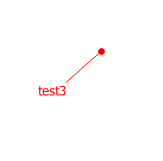 [SOLVED] Straight Lines from Label to Feature in QGIS? 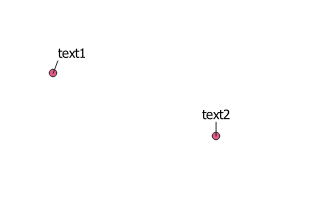 [SOLVED] Adding lines connecting labels to points in QGIS? [SOLVED] Getting the height and width of labels in QGIS? [SOLVED] Creating multiple lines label in QGIS?